Solutions that protect your samples with 24/7 Monitoring and Traceability, a unique Laboratory Monitoring and preventive alerting solution. With Laboratory Monitoring Online LIMS keeps a close tab on all new global industrial regulations and laboratory needs. Stronger quality controls are required in environmental monitoring, sample testing, and storage. ISO standards are evolving and demanding more automated processes and data controlling. ISO/IEC 17025 helps laboratories develop their management system for quality, administrative, and technical operations. Laboratories can also use this certificate to confirm or recognize the competence of their work in this competitive industry. Stronger controls through automated solutions allow companies and laboratories to more quickly respond to data that has gone beyond acceptable levels, optimize their resources, and increase productivity through cost efficiency. Capturing information from multiple pieces of equipment and sensors can be very time and cost consuming and the manpower needed to manually gather the information can also be very expensive and is not always precise and consistent. An even higher cost is added if the equipment is distributed across the company complex or even off-site. 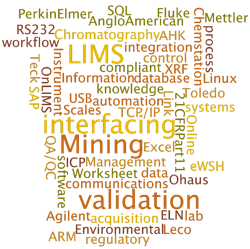 To satisfy companies’ needs to gather information from multiple sources quickly and accurately, Online LIMS has developed a suite of solutions that interact across different devices and are linked directly to the current LIMS system, and therefore meet different needs. 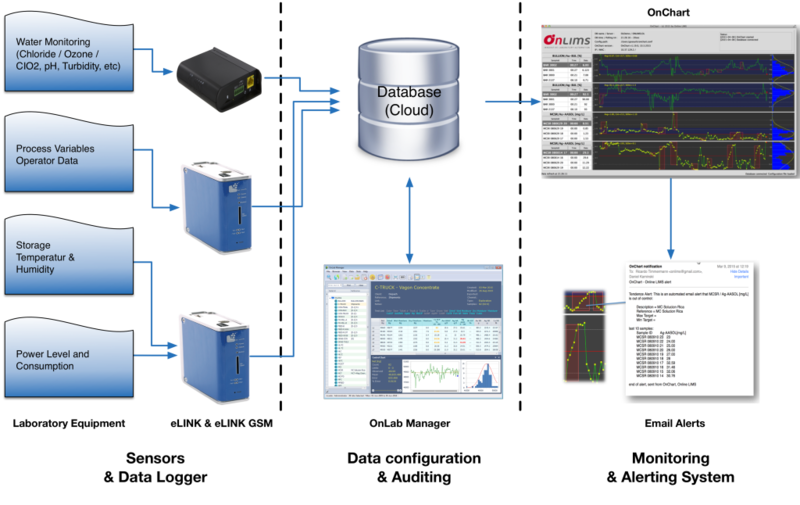 The resulting solution, a Laboratory Monitoring System can be implemented for off-the-grid system-sensor data that needs to be manually gathered from equipment outside of the laboratory’s internal network, like water, weather, and air monitoring. On-the-grid solutions are designed to constantly measure equipment on the same complex or site as the laboratory and company network, such as: storage temperature or humidity, power levels and consumption, and other variable processes and operational data. A Data Logger is used to capture sensor data from virtually any device that is located in or out of the company complex. This data is sent directly to a database system using native ODBC drivers, where it can be monitored and analyzed with our OnLab system. OnChart will read data from the database system, analyze it and send email alerts to the respective, responsible users, revealing any data that has gone beyond acceptable levels or even when the data shows that an unwanted trend is forming. This will allow the user to make decisions based on real-time data. An industrial factory is not allowed to emit more the 1000ppm CO2 per day. Emission levels are measured every 2 hours while the factory is working. Before a scheduled measurement, a machine malfunctions, emitting ten times more pollution than it is supposed to for 10 minutes. Therefore, if there are no changes emission levels will exceed the standard limit for the day and the company will have probably pay a large fine. The system will send the company an alert that the C02 emissions are higher than normal. The client can then decide how to respond. All benefits derive from the ability to store and monitor data from any on-line or off-line instrument with your current database (LIMS) system. In addition, the most remarkable benefit is OnLab’s built-in data analyzer feature that predicts if measurements have or possibly will go beyond acceptable limits and alerts you by email. Controlling and monitoring live instrument data with the right tools will allow your company to make faster decisions with accurate information. A time-consuming, manual process will be transformed into a fast, automated process, where human errors in collecting and processing information will be reduced to zero, allowing the company to concentrate its resources on its core functions and attain higher productivity and efficiency in its work.